While every bride wants her wedding bouquet and other flowers to be unique, some flowers are consistently popular. Knowing what these flowers are and why they're a top choice for wedding flowers will help you plan your wedding floral arrangements to be unique and beautiful. No other flower is as popular for weddings as the rose. With a wide range of sizes and colors available, this fragrant bloom is symbolic of love and passion, making it doubly popular for weddings. From bridal bouquets to strewn rose petals from flower girl baskets, roses are a popular symbol of love and romance. 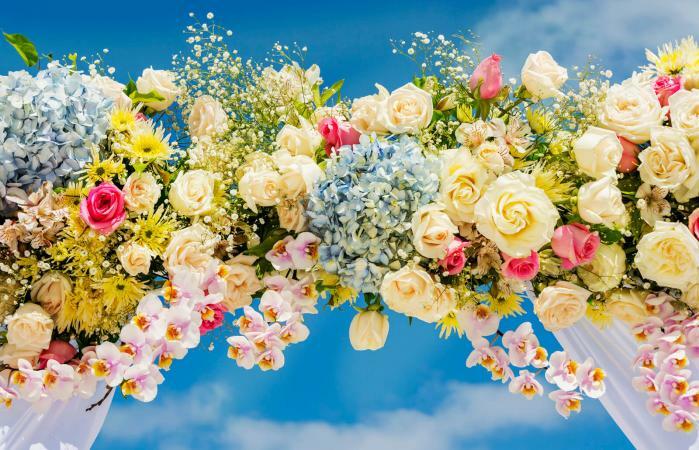 A wedding arch is an ideal form for a rose garland. Decorate the rows of pews or chairs with small bouquets of roses. The head table centerpiece can overflow with cascades of roses while smaller rose centerpieces can grace the guests' tables. Pin a small bouquet to each food table corner or opt for a centerpiece. 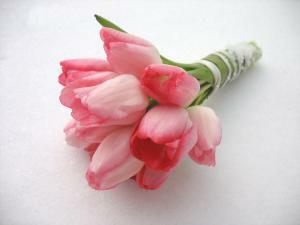 A beautiful spring bloom that is easily cultivated, the tulip is a sophisticated and sweet choice for weddings. Tulips symbolize happiness and also come in a range of colors and styles, giving brides many options for floral personalization. Take advantage of long-stemmed tulips by creating centerpieces from tall cylindrical vases. Add some colored florist glass stones for an effective colorful table decoration. Create an amazing visual using artificial tulips in the tall vases filled with water and topped with floating votive candles. Tulip buds make great boutonnieres for the wedding party. The long stems also lend themselves to pew markers or chair row markers that are an unexpected beautiful addition to bows and streamers. 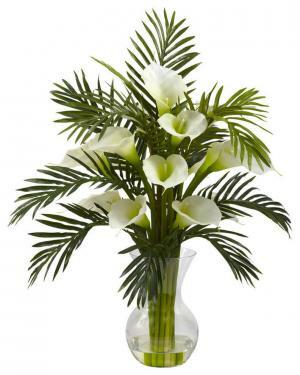 Brides interested in an elegant, sophisticated flower can't fail with the calla lily. The smooth curves of the trumpet-like blooms are feminine and romantic. These flowers are available in many sizes and colors. If you're looking for a flower that will give you a big bang for your buck, the calla lily is it! This flower is also popular for its lush tropical appeal. It is a favorite for beach and island-themed weddings. A great choice for any wedding where you want to add a flair of the exotic to your decorations, the calla lily can be used with palm frond fillers to accomplish this and more! The flower bloom is supported with a thick stalk-like stem that makes it equally substantial. It's a great design choice for tall vases and presentation style bouquets are ideal for a different type of bridal and bridesmaid bouquets. These full, textured blooms are economical and a fun choice for wedding flowers. Hydrangeas are available in green, pink, white, burgundy, and blue hues and are a great option for full bouquets or filler flowers. This flower offers an amazing visual for any bride concerned about keeping within a conservative budget, but giving a grand show of flower power! This makes hydrangea a popular choice for weddings. 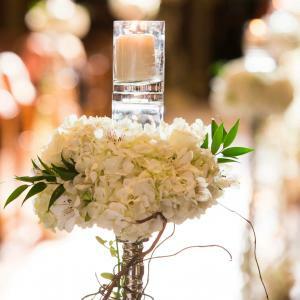 The cluster of flowers forms a ball shape that can easily be suspended from pews or chairs, added to table decorations, candle centerpieces and of course bridal and bridesmaid bouquets. The large range of color choices makes it a highly prized and versatile wedding flower. 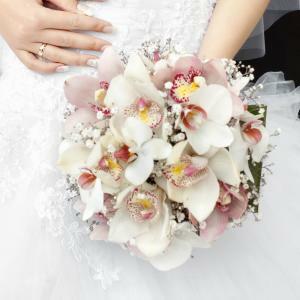 Another exotic and popular choice, orchids are a lovely wedding flower that can add a colorful, tropical touch to any bouquet or floral arrangement. This flower is associated with high-end luxury and it's inclusion in your wedding decorations makes a statement of opulence and elegance. You can use orchids with their naturally curving stems by themselves for table decorations and/or draped over a wedding cake for a graceful and charming style. Brides often select an orchid over another flower choice for a hair adornment either with their wedding gown or in the departure for their honeymoon. A destination island wedding isn't complete until a few orchids are added to the bridal bouquet and the groom's boutonniere. This star-shaped flower is a petite accent that adds a flirtatious touch to any wedding bouquet and is perfectly suitable as a central bloom for simple bouquets or as fillers for larger arrangements. This jasmine variety has the added value of a rather strong and pleasing aroma to highlight any wedding ambiance. These delicate flowers are often chosen for bridal flower crowns or tiaras. 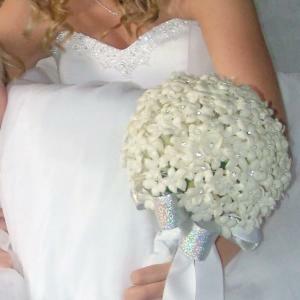 Silk stephanotis flowers are used to create stunning bridal bouquets with pearl or rhinestone centers. The sweet innocence of a daisy is perfect for a casual garden wedding in the spring or summer. These are affordable, easy to find flowers offer a wide range of colors and sizes to choose from. 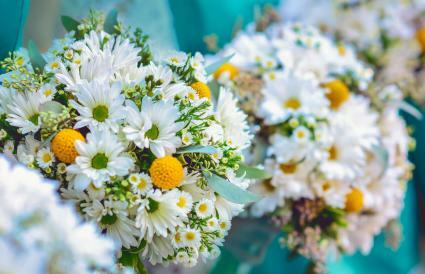 You may opt for a simple white daisy bouquet or go for the bold colors of Gerbera daisies to be used in bouquets, boutonnieres, centerpieces and other wedding decorations. Daisies are often used as secondary or filler flowers in bouquets featuring more expensive flowers. The daisy shape and size will provide a nice addition to the texture of flower arrangements. Gardenias delicate blooms, but their rich scent is attractive without being overpowering, and the soft curves of their petals make them a wedding favorite. 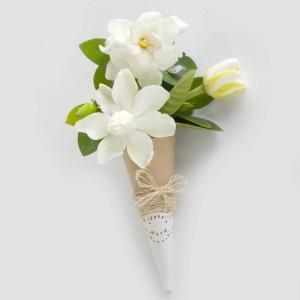 This is a nostalgic flower choice ideal for any romantic wedding design whether you've opted for a vintage style gown or a modern wedding gown. This flower was so popular for bridal bouquets in the early 1900s that it, along with lily of the valley, was featured in The American Florist, a weekly journal for the florist industry, with a stunning photo of how elegant the two flowers were when used together for a wedding bouquet. The gardenia has shown amazing staying power over the last century and still reigns as a popular bouquet and wedding flower choice! Peonies are large, full blooms and may be a bit more expensive than other wedding flowers, such as roses; however, the size actually makes them more affordable in the long run. When you select peonies, you'll discover it takes fewer blooms for a bridal bouquet, bridesmaid bouquets and any centerpiece or other floral use you need for your wedding and/or reception. The colors are striking from white, pale pink to deep magenta, light lilac to deep purple. Some Chinese peonies bloom yellow, blue or green. Other varieties feature white with rose or red streaks, so there are plenty of color choices for any bride. This flower also brings a pleasant fragrance that is sweet and alluring. This can add to the ambiance of your wedding that guests will long remember. Not only is the peony the bearer of large blooms, but it also is a beautiful flower when the flower head is fully opened to reveal a highly textured flower of ruffled layered petals. It's no wonder brides choose this amazing flower over others. Ranunculus features large and layered blooms. Mildly scented, the flowers come in bold shades of cream, white, yellow, red, purple, orange, and pink. These flowers are often chosen as roses alternatives even though roses are typically large blooms. 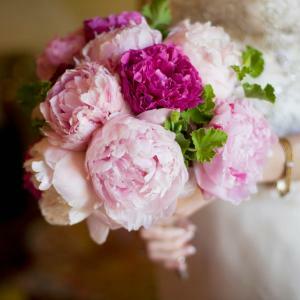 Some brides use both along with peonies for a truly textured and full bridal bouquet. Ranunculus make great boutonnieres and add a touch of whimsy to wedding decorations with their circular layers of petals that seem never-ending. If you want a flower that mystifies by its sheer beauty and color, you definitely want to include this one in your wedding decoration plans! It might seem counterproductive to choose from the top wedding flowers if you want a unique bridal bouquet and other arrangements, but there are many ways to personalize your flowers without needing unusual and expensive blooms. Choose unique colors or blooms with multiple colors for a bold visual impact, using white only as an accent. 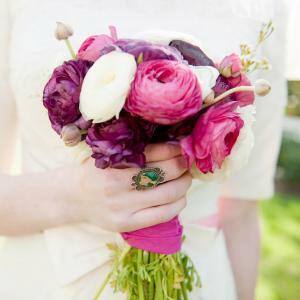 Opt for a less common bouquet shape, such as an arm bouquet instead of a cascade. 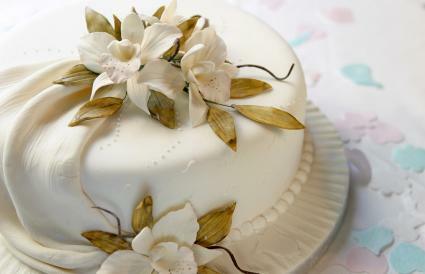 Use common flowers in unique ways, such as using stephanotis as the main burst of blooms with small roses as fillers. Coordinate with other floral arrangements, including centerpieces, pew flowers, and floral cake toppers for a sophisticated floral palette. 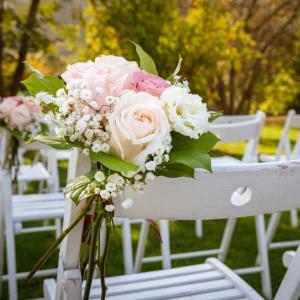 Whether a bride is interested in a simple bouquet with one type of flower or prefers a mixed bouquet with different blooms, knowing the most popular choices is a great way to begin imagining her perfect wedding flowers. The top wedding flowers are popular for many reasons, and there are many ways that couples can use these blooms to create unique and beautiful floral arrangements for their wedding. From the bridal bouquet to wedding reception centerpieces, these top flowers can fill all your wedding floral needs.